“Homeland Security Secretary Janet Napolitano will announce her resignation on Friday, according to Reuters and the Los Angeles Times. 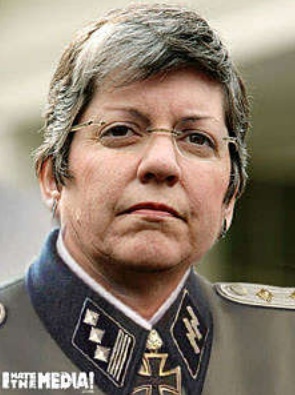 k) The people of the State of California need to demand a full and thorough audit of the University of California, the Board of Regents & the Governor of California: If the University goes forward with the appointment of this lesbian-traitor, who is not qualified to be anything in this country given the crimes she committed, we will have sold ourselves out. “UC officials believe that her Cabinet experiences ­- which include helping to lead responses to hurricanes and tornadoes and overseeing some anti-terrorism measures -- will help UC administer its federal energy and nuclear weapons labs and aid its federally funded research in medicine and other areas. Napolitano has been secretary of Homeland Security since 2009 and is the first the first woman to fill that role. She previously served as Democratic governor of Arizona. “I told you I follow you on Rense and I do. I already read Self Anointed this morn and could only shake my head at the waste of time. Even if it is the truth--- which kudos it is. k) In Oklahoma Catholics made up only about 5 % of the Christian population. I left that church early without being “confirmed.” Since I was old enough to understand the English language people have been telling me to ‘surrender’. Surrender to the church, to the school, to the family, to the city, to the military, to society’s misbegotten socialist regime—and to all of it I have always refused to surrender under any circumstance. I have made and lived my life, and lived with the consequences of my decisions. k) Each of us must decide for ourselves about how to compose our lives according to whatever each of us believes in. I believe you believe this as well. The dictums of others that arise whenever someone tries to control the private-lives of other people cannot be tolerated. Regardless of how well intentioned any movement might be. Each of us must remain responsible for our own lives. Over the years I’ve made a lot of mistakes. I have always tried to leave the private beliefs of others alone. What you have obviously discovered works for you, but it is not my way of living. “You should be enjoying what is left of your life if this is what you know to be true in this Self Anointed article. It has been this way most of the year and it is time to get on with it. Nobody is going to do jack about anything so all you are doing is kicking against the pricks as the scripts say. Which is just WRONG on every level. I’ve asked the universe for help and she has always given me what I needed to continue. Maybe it’s not what I thought I needed, but it is usually what was required. I have fought a lot of battles. Most of those I fought with are no longer here, yet for some reason I’m still breathing. I doubt this has been because of me. There is something I’m here to do, even if I still don’t clearly know what that ‘something’ is. For me this deadly-battle is just another part of everyday life. The world is totally connected to everything: From every part of nature to whatever each one of us does with our own lives. There are laws of nature that cannot be challenged. In the end the people who committed so many crimes upon others and the earth, must face the consequences for their behavior. As just one man who is part of the universe I have an obligation to continue to do what I can to crush those that have made the world into this killing-field that can no longer sustain life, in any recognizable-form. While I understand your wishes and respect them, I cannot do as you suggest.